new to the site, searching for care info. recently bought two gecko's from a local show. Last edited by sabercat56; 11-06-2018 at 08:59 PM. 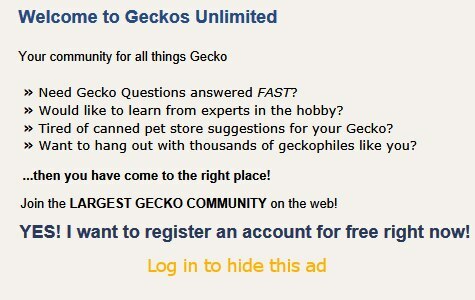 Welcome to Geckos Unlimited! Cyrtodactylus is a pretty awesome genus. I keep and breed Cyrtodactylus peguensis zebraicus. Their care may be similar to Cyrtodactylus louisiadensis. 14 Feb 2017: And NOW 2 Cyrtodactylus peguensis zebraicus hatchlings! Another resource is FB's Bow-Fingered Geckos-Cyrtodactylus group. thanks for the info. I've been treating them same as my other gecko's till I learned more. temp and humidity hovering at 70. both were dehydrated one really bad. she has sat at her water dish drinking on and off all day. You're welcome! I feel GU is all about sharing. Re-hydrating dehydrated geckos is the first rule of thumb prior to feeding them. That's much better for their internal organs. By the way, are your 2 noobs wild caught? Mostly like they are insectivores. Mine really like Exo Terra's twisty vines WITHOUT moss! Even for my adults I twist one vine with another or back onto itself. Those give their boney toes something to grip and allows them to explore more of their enclosure. yes, I'm guessing wild caught. guy said he just got them in and was rare. very near adult size . liked them so well, had never seen them. bought them both. Last edited by sabercat56; 11-05-2018 at 10:08 PM. Let us know when they eat. Have you placed these females in separate quarantine enclosures apart from your other geckos for about 90 days? Examine their skins for mites. Mine have all been captive bred. That mostly takes away the mite worry. What brand supplements have you? My females sometimes lay infertile eggs as they reach maturity. They can reabsorb those eggs or lay them -- even though they have not been mated. That really takes a toll on them. One of my 10 month old subadult females recently went off food for 1 month! My first 2 females died from calcium crashes, even though the second was under vet care. Here's a GU thread I just found. Last edited by Elizabeth Freer; 11-06-2018 at 01:33 AM. good post. I've ran into the same argument in my readings. no one seems to agree on the exact taxonomy. yes, all my animals are in separate enclosures to avoid stress ,tails nips. I'm curious about your Reptivite. Does it contain D3? I've been supplementing my sub-adult cyrts from the time they hatch with a 1-2 week rotation of Reptivite (no D3), Zoo Med Repti Calcium (with D3), and plain calcium carbonate (either Zoo Med's Repti Calcium or NOW). That's definitely more than I supplement any other gecko, but they've done well by it. They seem to require all that calcium carbonate. That's a benefit of Zoo Med products. My 2 female breeders and the upcoming male usually get each of these supplements at one feeding per week. At 1 feeding they get 2 medium crickets lightly dusted with Repti Calcium with D3, the next feeding they get plain calcium carbonate, and the 3rd feeding per week they get Reptivite (without D3). My vet has suggested using a wee pinch of Reptivite at no more than at 1 feeding per week, especially because too much retinol could cause problems. My crickets eat finely ground Zoo Med's Natural Adult Bearded Dragon Food and sometimes Cricket Crack.